I’m not sure whether they were eating or just sunbathing. Then I started to hunt for them and I found them in the new flowers of every euphorbia in the Gravel Garden and all over the box topiary. Ladybirds like to spend the winter in a dormant state tucked away somewhere warm and dry. Usually they stay outside hidden under leaves or in conifers but sometimes they cluster indoors in the uppermost folds of your curtains. They reappear in early spring when they venture out of their cosy winter hiding places to find food. Today was lovely and warm so perhaps that’s what triggered their appearance. 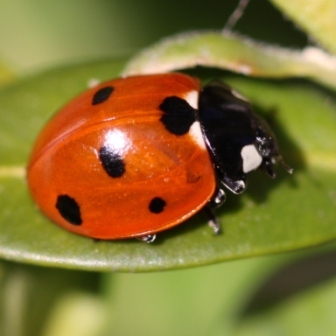 Ladybirds and their larvae are known as the gardeners friend. They feed on sap sucking aphids such as greenfly and blackfly. Apparently every Ladybird eats around 5,000 aphids each year. There’s no need to spray with harmful chemicals to get rid of aphid pests, adult Ladybirds and their larvae will polish them off for you. Every year in March the growing tips of the box topiary in my garden is covered with aphids. Perhaps the Ladybirds were hoping for an early feast. I can’t see any aphids yet so hopefully the beetles will find something else to eat until the aphids appear.